Paterson, NJ (April 23, 2018) . 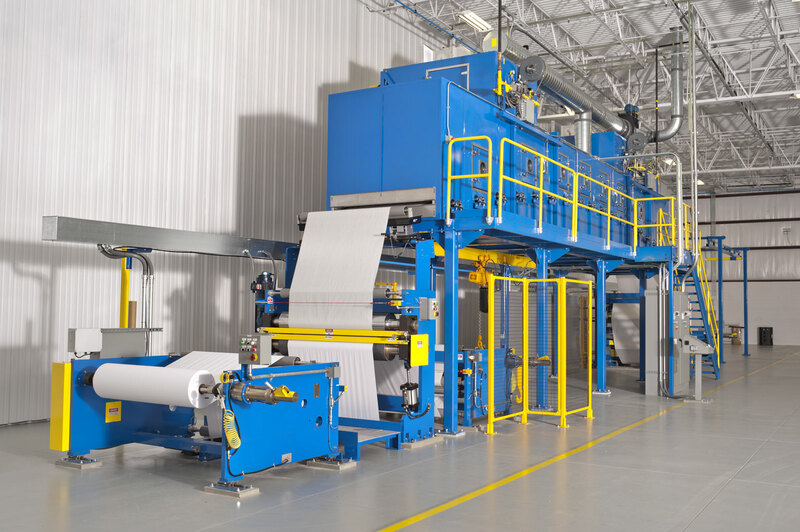 . . New Era Converting Machinery Inc. has released a new video showing a New Era coating and laminating line in operation at Polykote Corporation (Easton, PA). The 62” wide coating and laminating line, purchased by Polykote in 2017, is now up and running, and it is exceeding the expectations the specialty coating company had for its new equipment. The 3-minute long video, currently posted on New Era’s website and on YouTube, shows Polykote President John Guzzo and Business Manager Nick Guzzo talking about the advantages the company has gained from the New Era line, including the ability to run 3 times faster with larger diameter input and output rolls, equating to 4 times greater efficiency. Polykote Corp. is a specialty coating and laminating company that focuses on unique customer applications using rod, slot-die, flexographic and gravure application methods with water-based coating, 100% solids coatings and other proprietary formulations. The New Era line is used for Polykote projects and also for Virtual Graphics LLC, Polykote’s sister company. Virtual Graphics is a unique label converting company that produces their patented, leuco dye free, direct thermal color material “RevealPrint®“, that delivers color without using ink or ribbons. The coating line is a purpose-built machine capable of running at 500 fpm under constant, closed loop tension control. The machine can handle 50” diameter input bundles at 62” wide, laminating two materials prior to windup. Featured is a specialty coating station, which is of modular design that will allow Polykote to change coating technologies in the future as their business grows.